Diagnosing the cause of back pain can be difficult. Your back is made up of muscles, disks, bones, nerves, ligaments and tendons. Often problems arise due to an injury but sometimes the cause is not determined. The Licensed Chiropractors at Caron Chiropractic, P.A. have expertise in diagnosing and treating many types of back pain. We utilize treatments including Chiropractic Adjustments to correct balance and many times bring instant relief. 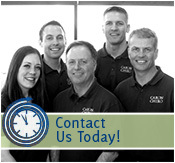 Our experienced staff treats patients at our St. Paul, MN office. The human body has an incredible Ability to Self Heal. Licensed Chiropractors are highly educated in the skeletal system, muscular system and neurological systems. We understand how the different aspects interact and work together to enable the body to heal naturally. Chiropractic Adjustments are widely recognized for the providing safe and effective relief for chronic back pain. An experienced Licensed Chiropractor can evaluate your symptoms, health history and conduct a physical examination. A spinal x-ray may be needed to determine the underlying cause of your back pain and rule out a more serious problem. After your chiropractor has concluded if your back pain will be helped through chiropractic care, a treatment plan can be determined. Chiropractic Adjustments are the most widely used form of chiropractic care. It is a hands-on therapy that uses a controlled force to bring your spine into proper alignment. Spinal manipulation works to correct balance in your spinal column and the supporting soft tissues. Patients can feel instant relief with improved mobility following an adjustment. Chiropractic Care may be used as a primary therapy or in conjunction with other traditional medical treatments. Patients who utilize chiropractic adjustments to relieve back pain often see better and longer lasting results. This can help them to heal better naturally without medications or invasive surgical procedures. Caron Chiropractic Clinic, P.A. provides expertise in Natural Therapies for the relief of back pain. Our approach to healthcare utilizes Chiropractic Adjustments as a way to Correct Balance in your body and enable self-healing. Our experienced Licensed Chiropractors can often provide Instant Relief through hands-on spinal manipulation and therapeutic exercise. This entry was posted	on Friday, March 6th, 2015 at 4:18 pm	and is filed under Back Pain, Chiropractic Treatments, Chronic Pain. You can follow any responses to this entry through the RSS 2.0 feed. You can leave a response, or trackback from your own site.